Adrenal fatigue has existed as long as we have, but it has only reached epidemic proportions over the last 100 years. Why is this? The answer lies in the way that our lifestyles have changed over that time. The average person’s stress levels, diet and toxic load are all immeasurably worse today than they were at the start of the twentieth century. At the simplest level, adrenal fatigue is caused by the inability of your adrenal glands to cope with stress. But to really understand your condition you need to know how your adrenal glands have reached this point. You instinctively know that your adrenals are performing sub-optimally, but what is the reason (or reasons) for this? On this page I’m going to list the major causes of adrenal fatigue. This is by no means an exhaustive list, but I would estimate that it covers more than 90% of adrenal fatigue sufferers. Some of you may be able to identify 2 or 3 causes on this list that apply to you, but the reality is that adrenal fatigue can easily be triggered by a single factor alone. You should also realize that adrenal fatigue is not something that happens suddenly. It usually takes years for your adrenals to become exhausted. So when you are looking to identify the reasons for your adrenal fatigue symptoms, remember to look back a few years into your past. That traumatic emotional or physical event that happened five years ago might have been just enough to send your adrenals on a long-term downward spiral. The number one cause of adrenal fatigue is, without a doubt, stress. And as you know, this can come from any area of your life. Whether it’s a relationship gone wrong, an unreasonable boss, relocation to a new city, or sleepless nights looking after a newborn baby with colic, the effect is the same. This is the kind of low-grade stress that feels manageable in the short term, but can have terrible effects on your health in the long term. 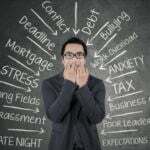 There are lots of strategies for coping with stress, but by far the best is to simply eliminate the cause. Often that means leaving a bad relationship or changing to a more fulfilling job. Sometimes it might be as simple as using some organizational tools to simplify your life. Take a step back and think about what makes you truly happy. We eat more sugar now than we ever have. In fact over the last 200 years the average American has gone from eating 1-2lbs of sugar per year to consuming around 150lbs. Our genetics haven’t changed over that time, so how do our bodies cope with all these empty calories? Answer: we produce extra cortisol and insulin, which puts stress on the pancreas and adrenals. There is another link between sugar and adrenal fatigue. Eat too much sugar and you will put on weight, we all know that. But did you know that excess weight can also be a contributing factor towards adrenal fatigue? Just think of all the extra stress that an extra 50 or 100lbs must place on your body and internal organs. If being heavier makes you feel tired, chances are its tiring out your adrenals too. Do you ever feel like you’re burning the candle at both ends? If you’re struggling to find a work-life balance and finding that you just can’t fit enough into a day, you’re probably not getting enough sleep. Our ancestors got a healthy 9 hours of sleep per night, but these days some of us survive on half of that. The average American now sleeps 6.1 hours each night, but those who are in the early stages of adrenal fatigue are often getting much less. Why does this matter? A long restful sleep is exactly what your body needs to repair itself. The body is an extraordinary self-healing organism, but it needs time to work its magic. Stick to at least 7-8 hours of sleep (or longer if needed) and you will much less likely to suffer from adrenal fatigue. Start cutting that short and your adrenals will begin to suffer. I mentioned ‘toxic load’ in the first paragraph of this article. When I say that, I’m referring to the overall level of toxicity that we face through our daily existence. Toxins in our food, pollutants in the air, chlorine in our drinking water, antibiotics in our meat, and pesticides in our vegetables… These are all factors that contribute to our toxic load. Each year an estimated 2,000 chemicals are introduced to the consumer marketplace. Some go into our food and some go into products we purchase, but very few are fully tested for human safety. Taken together, these chemicals and toxins can ultimately lead to serious conditions like Alzheimers, cancer or heart disease. But even if you don’t suffer from these, they can materially affect your quality of life by affecting your immune system, your digestion and more. How does this affect your adrenals? Well, many of these chemicals are known to directly disrupt adrenal function. Often your body (specifically the other parts of the HPA axis) will make a temporary adjustment to compensate. But if you continue to disrupt your adrenal glands over a longer period, adrenal fatigue becomes a more likely outcome. When we talk about long-term stressors to our adrenal glands, we must not forget to include chronic diseases. Whether you suffer from asthma, arthritis or diabetes, they all place demands on your adrenal glands that are above the norm. When you suffer from these conditions for a long period, your adrenals can become overworked and fatigued. You should also know that the treatments for these chronic diseases are often stressful to the body too. Other illnesses that can weaken the adrenals are fibromyalgia, lyme disease, parasites and any condition that can cause chronic pain. Adrenal fatigue can be caused by more than just long term factors – moments of severe physical trauma can also lead to adrenal fatigue. It used to be thought that a single, physically traumatic incident would have no long term impact besides the obvious scars and healing. But evidence now suggests that such moments of trauma have a much more enduring impact on our health, and may affect things like hormonal balance and adrenal performance many years later. I’m not just talking about car crashes and other accidents. Major surgery falls decisively under this category too, as it is extremely stressful for the body. If you can trace your symptoms back to a single incident several years earlier, you may have found the original cause of your adrenal fatigue.